Three rows of sheer elegance! 14k yellow gold huggie earrings feature sixteen round brilliant cut cubic zirconia styled in three rows for an endless look of sparkle. Always bright and always right, these 14k gold huggie earrings are delightful for women and girls. A huggie hoop sits close to the ear for lightweight, all-day wear. CZ earrings are priced to please and make a great alternative to diamonds while traveling or going about your daily routine. 14k yellow gold three row CZ earrings will arrive in a gift box so perfect to keep or ready as a present. We take great pride in the quality and craftsmanship of our jewelry. Plus, we want you to enjoy wearing the earrings as soon as possible so they will ship within just a few days. We trust you will love these earrings but if you find they don't suit your style, simply return within 30 days of purchase for a full refund or replacement. 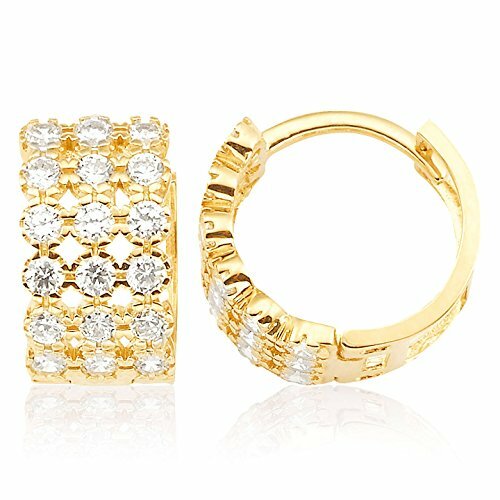 ★ GOLD FOR GOOD: Made from solid 14k yellow gold, these three rows CZ huggie earrings are perfectly sweet for women and girls. The sparkling CZ accents add shine with a subtle elegance that works with other pieces or on their own. ★ NOT JUST GOLD: While the solid 14k yellow gold is impressive on its own, the sixteen cubic zirconia will dazzle all. Perfectly suited for day or evening wear. ★ THERE IS NO WAIT: Delivered today or tomorrow, these gold and CZ huggie earrings arrive quickly so you can start wearing them when you want and where you want.